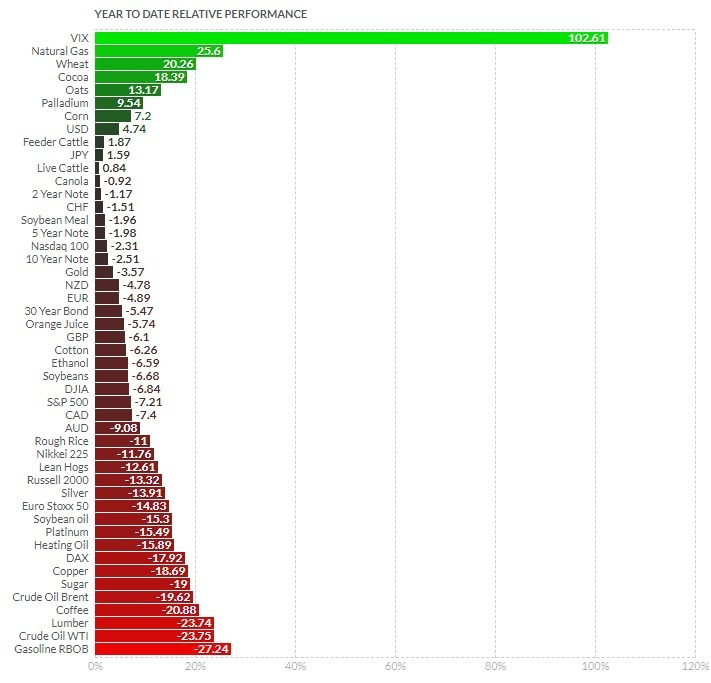 As we head into the holidays and the end of the year, let’s take a look at the 2018 performance for the world’s biggest asset classes, currencies and commodities. As you can see, there’s a lot of red. Global stocks are down. Bonds are down. Major commodities, down. Gold, down. Foreign currencies, down. Now, as we’ve discussed, major moves in markets are often triggered by a very specific catalyst, and then prices tend to drive sentiment change, and sentiment then tends to exacerbate the move in markets. There are always plenty of stories, at any given time, that can sound like rational explanations to fit to the price. In the case of the declines across asset classes this year, we’ve heard many viewpoints from very smart and accomplished investors over the past week, with concerns about the Fed, debt, deficits, slowdown, the end of an expansionary cycle, etc. With all of this said, often times the driver behind these moves in markets is specific capital flows (forced liquidations), not an economic narrative. With that, in rear view mirror, a lot of times (historically) all of the pontifications surrounding markets like these end up looking very silly. For example, let’s take a look at the run-up in oil prices back in 2007-08. Oil prices ran from $50 to almost $150 in about 18 months. Everyone was telling the world was running out of oil — “peak oil.” Did everyone get supply and demand so wrong that the market was adjust with a three-fold move that quickly? The reality: the price of oil was being driven by nefarious activities (manipulation). A major oil distributor was betting massively on lower oil prices and ran out of cash to meet margin requirements, as they were consequently squeezed (forced to liquidate) by predatorial traders that pushed the market higher. Among the predatorial traders, the largest oil trading company in the world, Vitol, was found to have been essentially controlling the oil futures market. When the CFTC (the regulators) finally came knocking to investigate, that was the top in oil prices. In the case of recent declines, the catalyst looks to be geopolitical (not economic), which then has given way to an erosion in sentiment (which can become self-fulfilling). The geopolitics: We’ve talked about the timeline of the top in stocks back in January, and how it aligns perfectly with the release of very wealthy Saudi royal family members and government officials, after being detained by the Crown Prince for three months on corruption charges. And then the decline from the top on October 3rd (both stocks and oil prices) aligns, to the hour, with the news that the Crown Prince would be implicated in the Khashoggi murder. These two events look like clear forced liquidations by the Saudis to retrieve assets invested in U.S. (and global) markets (assets that are vulnerable to asset seizures or sanctions). Beyond this selling, we also have a party that might have an interest in seeing the U.S. stock market lower: China. Trump has backed them into a corner with demands they can’t possibly fully agree to. If they did, their economy would suffer dramatically, and the ruling party would be highly exposed to an uprising. Could China be behind the persistence in the selling. Quite possibly. Bottom line: The lower stock market has put pressure on the Trump agenda, which makes it more likely that concessions will be made on China demands. My bet is that a deal on China would unleash a massive global financial market rally for 2019, and lead to a big upside surprise in global economic growth.